The changing economic landscape of India is showing up in the regionwise break-up of income tax collections. Mumbai, the business capital of the country, still contributes the largest, 29%, of total income tax revenues, but its share has been falling. Delhi, the second-largest contributor to the tax kitty, saw collections rising 45% from April to November 13 this year over the same period in 2017. 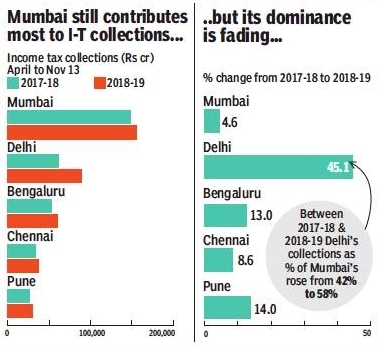 Collections in Mumbai rose only 5%. Slower growth in Mumbai is attributed to hefty refunds. The massive growth in Delhi has helped the region increase its share in total collections to 16.5%, a jump of over five percentage points compared to a year ago. The region’s growth was much higher than even smaller centres like Chennai and Kolkata which recorded single-digit growth rates during these seven and a half months. “The department has been proactive in paying refunds across the country. But the number should be seen in the context of refunds paid out in Mumbai, which have been quite high,” said an official, without disclosing details. Another official said that refund claims in the capital were not high, which were reflected in the gross collection numbers, which were not immediately available. The high refunds may also be a pointer to the tax authorities getting large taxpayers in Mumbai to pay higher amounts last March to meet the annual target. However, even a less buoyant Mumbai is more than a handful for most of the other zones. 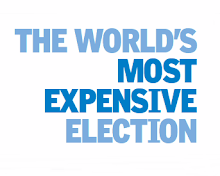 For instance, just the security transaction tax collections of over Rs.7,000 crore are higher than the total collections in zones such as Lucknow, Patna, Bhubaneswar, Guwahati and Nagpur. Up to November 13, direct tax collections were estimated at Rs.5.4 lakh crore, 14% higher than the Rs.4.7 lakh crore raised a year ago. CBDT chairman Sushil Chandra said. Chandra also said that the number of people voluntarily filing tax returns had gone up substantially, and 6.85 crore income tax returns were filed last year. This year so far, 6.02 crore ITRs have been filed.